As part of its celebration of Hispanic Heritage Month, Texas A&M International University will join KLRN, the Public Television station for Laredo, in hosting a special screening of the documentary On Two Fronts: Latinos & Vietnam, Thursday, Oct. 29 at 6 p.m. in the Student Center Theatre, Room 236. 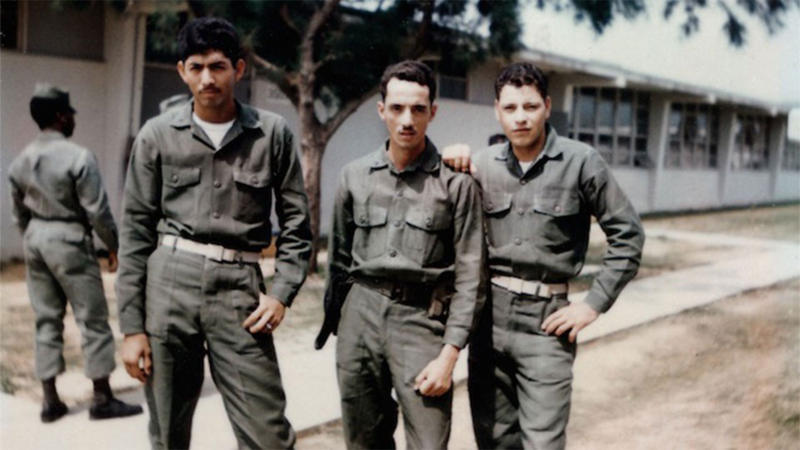 The film captures the legacy of Latino veterans and their families during the Vietnam War, and examines the Latino experience during a war that placed its heaviest burden on working-class youth and profoundly affected Latino communities like Laredo. Veterans and their families are especially encouraged to attend the free screening. Filmmaker Mylène Moreno of Souvenir Pictures frames the documentary, filmed in locations throughout the Southwest and Vietnam, with the memoirs of two siblings, Everett and Delia Alvarez. KLRN and TAMIU are frequent collaborators and have partnered for the campus’ KLRN-TAMIU Studio, dedicated last April and accompanied by a special screening of “El Poeta,” a documentary on Mexican poet Javier Sicilia. For more information on the TAMIU screening of “On Two Fronts,” call the TAMIU Office of Public Relations, Marketing and Information Services at (956) 326-2180, email prmis@tamiu.edu , click on tamu.edu or visit offices in the Sue and Radcliffe Killam Library, Suite 268. University information is also available on its social media sites on Facebook, Instagram, Twitter and YouTube.